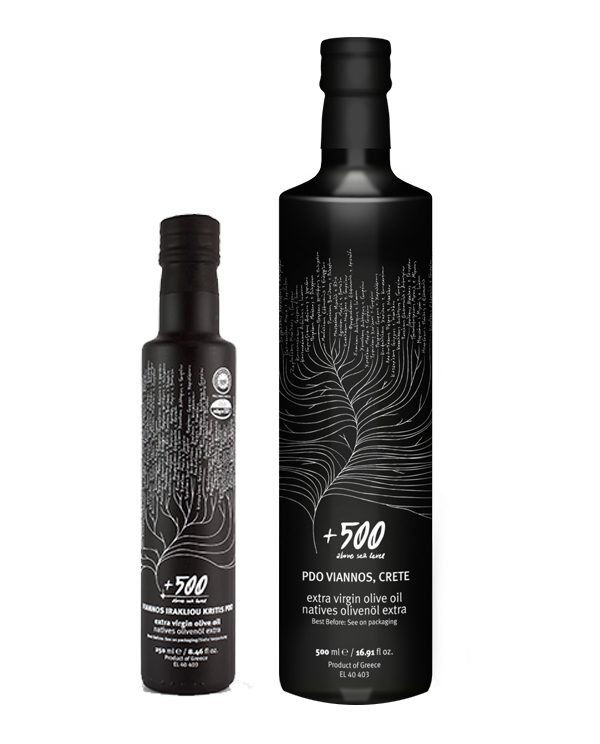 The extra virgin olive oil 500+ is produced exclusively in Viannos mountainous groves at altitudes above five hundred meters, as indicated by its name. Its production is limited since the selection criteria are very strict. It is of a very low acidity oil, with a strong personality and aggressive character. The unique temperament of 500+ is related to the particular soil and climate conditions in Viannos mountain, to the traditional method of cultivation and to “koroneiki” olives variety that seals its character. It is, without any doubt, one of the best samples of “Koroneiki” variety in Crete and the result of our own hard efforts. It is a product that makes us extremely proud. Our ambition is to continue to take care of it with love and respect and to offer it at the best possible price. Available exclusively in glass packaging of 500 ml.